Home > Art, History	> A Long Cloth Mandylion? Interesting. But whilst I agree the cloth appears to be significantly larger than a handkerchief, it’s a big call to say it might be approaching shroud size. To me it’s the size of a large towel. Display of the disinterred head of St.John the Baptist? First and Second Finding of the Head of St. John the Baptist (February 24). According to church tradition, after the execution of John the Baptist, his disciples buried his body at Sebaste, but Herodias took his severed head and buried it in a dung heap. Later, Saint Joanna, who was married to Herod’s steward, secretly took his head and buried it on the Mount of Olives, where it remained hidden for centuries. The First Finding occurred in the fourth century. The property on the Mount of Olives where the head was buried eventually passed into the possession of a government official who became a monk with the name of Innocent. He built a church and a monastic cell there. When he started to dig the foundation, the vessel with the head of John the Baptist was uncovered, but fearful that the relic might be abused by unbelievers, he hid it again in the same place it had been found. Upon his death, the church fell into ruin and was destroyed. The Second Finding occurred in the year 452. During the days of Constantine the Great, two monks on a pilgrimage to Jerusalem reportedly saw visions of John the Baptist, who revealed to them the location of his head. They uncovered the relic, placed it in a sack and proceeded home. Along the way, they encountered an unnamed potter and gave him the bag to carry, not telling him what it was. John the Baptist appeared to him and ordered him to flee from the careless and lazy monks, with what he held in his hands. He did so and took the head home with him. Before his death, he placed it in a container and gave it to his sister. After some time, a hieromonk by the name of Eustathius, an Arian, came into possession of it, using it to attract followers to his teaching. He buried the head in a cave, near Emesa. Eventually, a monastery was built at that place. In the year 452, St. John the Baptist appeared to Archimandrite Marcellus of this monastery and indicated where his head was hidden in a water jar buried in the earth. 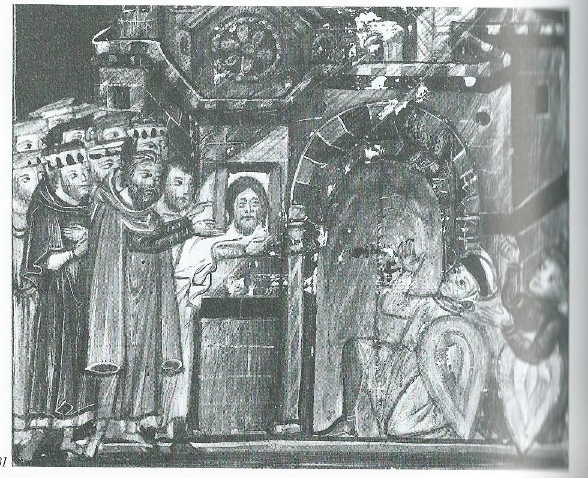 The relic was brought into the city of Emesa and was later transferred to Constantinople. Third Finding of the Head of St. John the Baptist (May 25). The head was transferred to Comana of Cappadocia during a period of Muslim raids (about 820), and it was hidden in the ground during a period of iconoclastic persecution. When the veneration of icons was restored in 850, Patriarch Ignatius of Constantinople (847-857) saw in a vision the place where the head of St. John had been hidden. The patriarch communicated this to the emperor Michael III, who sent a delegation to Comana, where the head was found. Afterwards, the head was again transferred to Constantinople, and here on May 25, it was placed in a church at the court. A very intriguing counter theory, Colin. The cloth is added in the drawing to show the viewer that head is a 3D object and not a 2D picture/painting. Yes, David, it was the extrusion of the fabric from out of the bottom front of the frame that made me think the figure’s head was 3D, maybe to preserve sensibilities re St.John’s manner of execution. But having scanned a few images under a variety of search tags, I’m now inclined to agree with both (!) 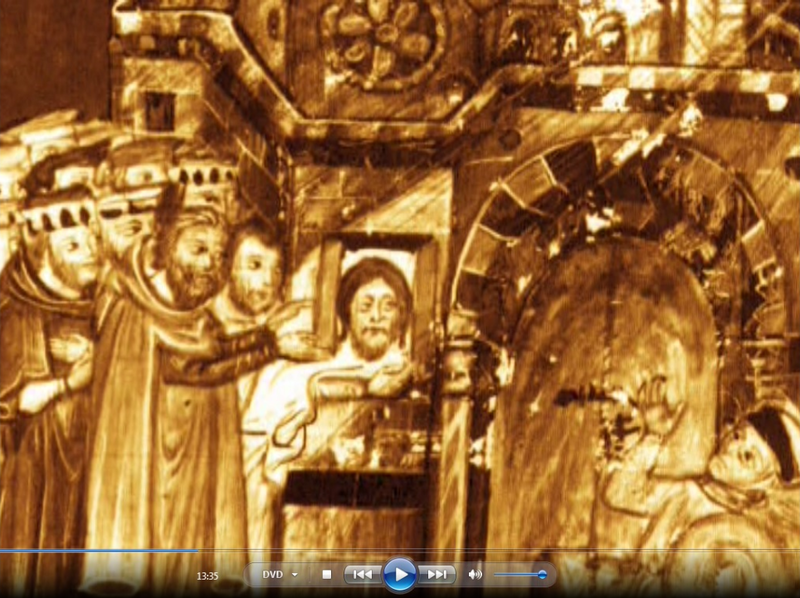 OK and Charles – it’s possibly a fusion or hybrid of the Image of Edessa and the Veil of Veronica. See my correction posted a few minutes ago. That would not prevent the Edessa image having been assumed in this artwork to have been one and the same as the still in vivo Veil of Veronica (as distinct from the Shroud). The image would certainly seem to be that of someone still living, though apparently lacking some Veil features we see elsewhere (crown thorns etc). Forget what I said about it being John the Baptist. Influenced partly by Charles’s comment, my money’s on it being an Image of Edessa/Veil of Veronica hybrid. for some time I’ve been searching in vain for the “Venetian epitaphios”, apparently the oldest extant epitaphios, circa 1200 AD. The setting for this ‘Mandylion’ appears western in inspiration. If you look, for instance, at the side of Siena cathedral, completed 1261 you will see a similar patterning of dark and light stone. Note also the Gothic rose window in the illustration. So as the Veil of Veronica is first recorded in about 1205, I suspect that this, or a copy of it, is what might be shown, but as we know this is only one of the veils showing just the face of Christ. Have we any evidence that it si the Mandylion from Edessa?? Or are you suggesting that this might be the Shroud being exposed when in the west in the thirteenth century?? Presumably this is the Bibliotheque Nationale in Paris. Accessing the manuscript may give further clues as to which veil/icon/or whatever this is as it seems to be part of an ongoing story. I only want to show that Mandylion was considered by some as something larger than a “little cloth” as it is often asserted by some sceptics. Nothing more, at least so far. It seems that this interesting illustration belongs to a manuscript that is in the ‘Bibliotheque Nationale de France” (BNF) in Paris. Some years ago, I went to the BNF for some researches. A quick look at the BNF free research engine ( http://gallica.bnf.fr/) does not provide any link to the original manuscript. If somebody could give me more information (tittle of the manuscript and/or author etc.) I could perhaps obtain more information and/or have a look at the original manuscript. Good research, Hugh. These look like interesting articles. These articles are fascinating and show just how easily legends develop into new forms and how difficult it is to distinguish between originals and copies. Brock tells us that the Paris manuscript, illustrated above, was probably made in Rome and has no less than 22 scenes. The big, owlish eyes and full-grown beard is what we see on early icons with the face of Jesus, very different from the face on the veil preserved in Manoppello. Yes -but it indicates little. 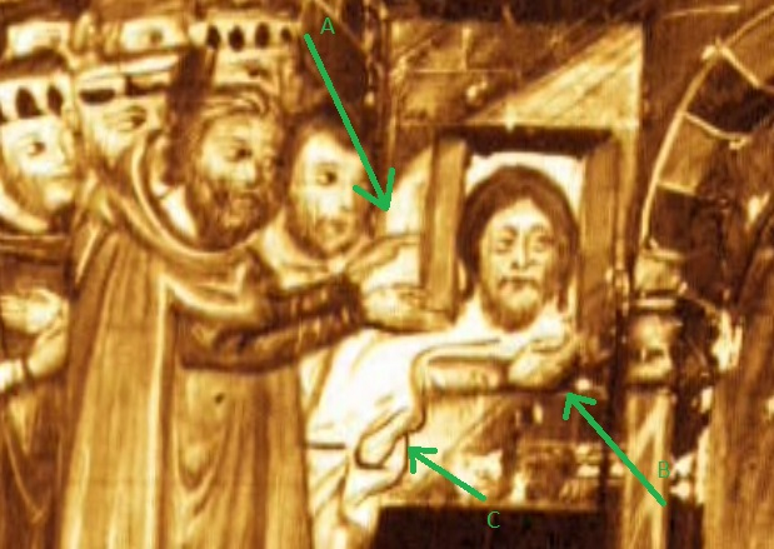 As I have shown ( https://shroudofturin.files.wordpress.com/2014/06/addendum-manopello-shroud-comparison3d.pdf ) there is a direct relation between faces on the Shroud and Manoppello. The other, complex issue is whether some images of Christ were modelled on the Shroud , or Manoppello (assuming the latter was Image of Camuliana and Veil of Veronica, according to Pfeiffer’s theory -see http://www.acheiropoietos.info/proceedings/PfeifferWeb.pdf ). There are ways to distinguish which image is based on which model, but we will discuss this later. Nice paper with great image processing and this kind of work should be encouraged and continue. Father Pfeiffer told me that he believed the veil was placed on Jesus’ face when he was wrapped in the Shroud and Ian Wilson, as you know, says something very different. His book on the topic was dedicated to Pope John Paul II, requesting some “glasnost” in the Vatican so that research on relics could be made. It is possible that important clues lie both there and in other churches, however IW’s plea fell on deaf years, but that also seems to have been the case with Professor Avinoam Danin when he suggested what could be done to further the research on what he is convinced he sees on the Shroud. might even be more interessting with clear blood marks over the left eye and with the face placed centrally on a vertical shroud. In later and earlier images in the collection though it seems like the cloth change perspective to a horizontal form. It should surely have been an unblemished, unbloodied image at the stage (or so it would seem to us out-of-area dilettantes). I paid attention to the smudge mark over the eye just for the reason you mentioned. The scene takes place in undramatic conditions. No sweat (Gethsemane) and no blood (burial) but still smudge in the right place compared to the shroud. The case would of course be stronger if it was epsilon formed. The “Veronica veil” is not based on the NT, but on tradition. Scripture does mention burial cloths. Great timing on this image, I was looking for something to illustrate Gregory’s sermon on August 16, 944. This is perfect.